The Suspended Castle – Book Review by Fred Patten. NYC, Candlewick Press/TOON Books, October 2015, hardcover $16.95 (53 [+ 1] pages). 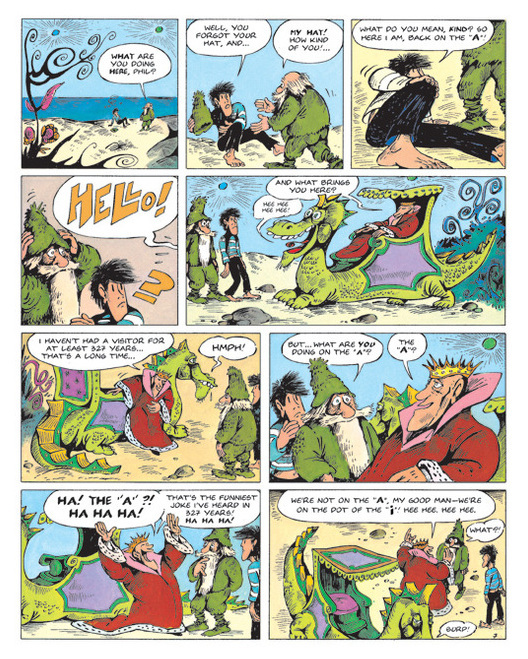 The Suspended Castle (Le Château Suspendu) is Book 3 in the Philémon series by Fred (Frédéric Othon Théodore Aristidès, 1931-2013), serialized in the classic French comics magazine Pilote. The weekly strip was collected into 15 books between 1972 and 1987. Fred retired leaving Philémon’s adventures uncompleted, until he wrote/drew a 16th volume to finish the series just before his death. Book 1, Cast Away on the Letter A, was reviewed here in January, and book 2, The Wild Piano, in June. Fred’s Philémon was/is a surrealistic cartoon strip in the tradition of Winsor McCay’s Little Nemo in Slumberland and George Herriman’s Krazy Kat. Philémon is a teenage farmboy in the French countryside of the 1960s-‘70s who falls down a well and has psychedelic adventures on the literal letters ATLANTIC of the Atlantic Ocean of a parallel world. The series is only marginally anthro-animal, but it contains many imaginative fantastic animals in bizarre settings that lovers of top-quality newspaper comic-strip art, and furry fans, will want to see. Philémon, and Fred’s other works, have been hits in France for almost fifty years, almost constantly in print. In the first two albums, teenager Philémon falls down an abandoned old well on his father’s farm in the French countryside and has fantastic adventures on the two A’s of the ATLANTIC ocean of a parallel world. He meets Mister Bartholomew (Barthélémy), an old Robinson Crusoe-like hermit from our world who was cast away onto the first A forty years ago. Philémon returns to his skeptical father Hector’s farm at the end of Cast Away on the Letter A, but he accidentally leaves Mr. Barthlomew behind. In The Wild Piano, Phil’s Uncle Felix (Félicien) turns out to be an amateur magician who knows how to return to the parallel world. (The “portal” is a different fantastic method each time.) He sends Phil back to rescue Mr. Bartholomew, which he does after more adventures on the letter N.
The Philémon series could have ended there, but it was one of the most popular in Pilote magazine, which was one of the most popular weekly comics magazines in France – in all Europe. And Fred was one of the most popular cartoonists. The Suspended Castle followed immediately. Philémon takes Mr. Bartholomew back to Uncle Felix, who grumbles that he’s not a travel agent but agrees to send Mr. Bartholomew back to the A via a tiny seashell that Phil inflates with a hand pump until it’s large enough that Bartholomew can enter it. He does, but Phil realizes that he’s forgotten his hat in his eagerness to return home, and Phil rushes into the seashell to give it to him. The shell deflates, trapping both Philémon and Mr. Bartholomew on the A. Only it’s not the A! The two have landed on the dot atop the I. The Suspended Castle is their adventures trying to reach the A. There are the two suns in the sky, and the giant Atlantic Ocean all about them. The Guardian-King of the I-dot island (riding in a giggling living dragon-carriage) sends them at night on the ray of light from an owl-lighthouse’s eyes (“the luminous pathway”) to the A. Unfortunately, dawn comes while they’re still traveling, the owl-lighthouse turns itself off, and the two fall into the middle of the ocean. They have adventures with a giant whale-galley filled with a subway and ruled by its tyrannical captain, get involved in a mutiny of the galley-rowers against him, are menaced when the whale-galley is attacked by giant pelican-riding whalers from the sky, escape from the whale-galley but are thrown into the midstof the ocean again when it dives, are rescued by the pelican-whalers and are taken as prisoners to their suspended castle in the sky (“Suspended from WHAT?”), are praised as the Cutters of the Rope prophesized 2,327 years ago, they cut the rope holding up the castle, it falls into the ocean and sinks, and they wind up on Hector’s farm back in France. A happy ending, except that Mr. Bartholomew still isn’t back on the A. The Philémon adventures were designed to be 48 weekly pages each in Pilote, to be reprinted in an annual album. This one was first published in October 1973. 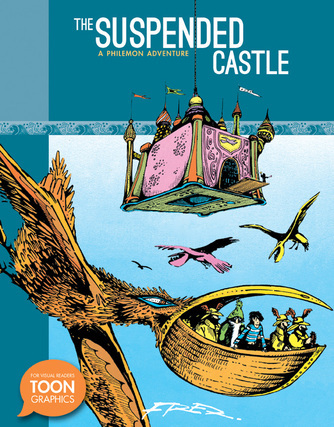 TOON Books are published for children – The Suspended Castle is recommended for readers 8+; grades 3+ — so it has added a six-page illustrated annex explaining all the references that adult French readers would have gotten, such as whaling, galleys, lighthouses, the subway (the Parisian metro), and the scenes in the whale-galley and later in the suspended castle where Philémon and Mr. Bartholomew are accused of crimes that nobody will explain to them (The Trial by Franz Kafka, where the naïve protagonist is arrested, tried, sentenced, and executed for a crime that is never explained to him). There is even a comparison of the castle dangling from a celestial rope with Hayao Miyazaki’s classic 1986 animated film The Castle in the Sky, which readers in 1973 would not have gotten. “FRED’s artwork was drawn in India ink, watercolor, and gouache.” A list of TOON Books’ Philémon Adventures includes The Impossible Voyage, which must be Le Voyage de l’Incredule (The Unbeliever’s Voyage, #4 in the series), in which Philémon’s “practical” father Hector travels with him into the world of the ATLANTIC and doesn’t believe a thing of what he sees. “The dwarfs are for the dwarfs!”, as C.S. Lewis said in The Last Battle. So there will be at least one more album in TOON’s Philémon series. Anthropomorphic animals? Well, no, but how can any furry fan resist knowing about/seeing the living dragon-carriage, the owl-lighthouse with light-rays from its eyes, the living whale-galleys filled with human rowers, or the giant pelicans with their beaks full of human whalers? Enjoy; enjoy!